This delicious Eggs Florentine dish is quick and easy to make and contains one of your 5-A-DAY. It can be enjoyed for breakfast, or as a healthy snack. · To poach the eggs, bring a large pan of water to the boil, reduce to a simmer. Crack the egg into a small bowl, tip into the pan of water and repeat for remaining eggs, reduce the heat, and cook until softly set. · Place the spinach into a non-metallic bowl, cover and microwave for approximately 1½ minutes on high, or alternatively in a pan on the hob, stir halfway through heating. Drain very well. · Toast the bread on each side. 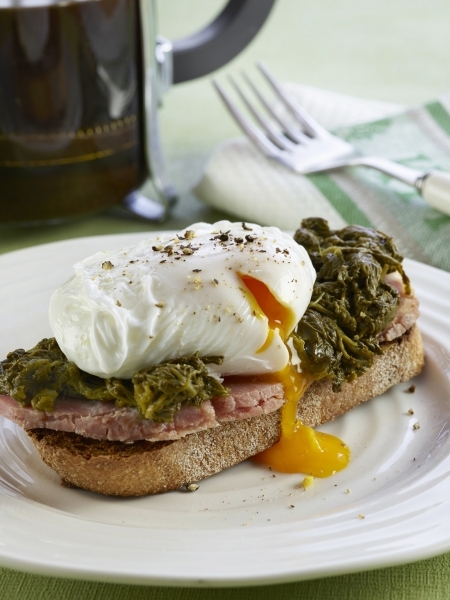 · Spread each slice of toast with mustard; place each on a plate and then top with ham and spinach. · Remove the eggs from the water with a slotted spoon, drain well and place on the spinach, season well and serve immediately. Hints and Tips: Try replacing the ham with a rasher of crispy bacon.